Tallahassee, FL—Jackie Fulford, who worked many years as Chief Assistant State Attorney for Second Judicial Circuit State Attorney Willie Meggs, before being appointed to the bench to replace a retiring judge in 2009, is currently facing multiple counts of misconduct charged by the Judicial Qualifications Commission. In 2010, Circuit Judge Fulford ran unopposed and retained her position on the bench. Circuit Judge Fulford mainly presided over cases in the Wakulla County Courthouse in the city of Crawfordville, which is located twenty minutes from State Attorney Willie Meggs’ main office located inside of the Leon County Courthouse in the city of Tallahassee. In June 2013, Circuit Judge Fulford spontaneously replaced Circuit Judge James C. Hankinson as the presiding judge in Leon County double murder and solicitation to commit first degree murder case, State of Florida vs. DeShon Thomas. The replacement occurred shortly after DeShon’s mother contacted Governor Rick Scott in regards to what DeShon’s mother believed to be a conspiracy building for over two years in the criminal prosecution of her 17-year-old son, DeShon Thomas. In the case, State of Florida vs. DeShon Thomas, DeShon had been charged with the January 2011 double murders of his pregnant ex-girlfriend and her younger brother. DeShon, a Black male, was a freshman at Tallahassee Community College and was working at Taco Bell at the time of being charged with the murders. Leon County Sheriff Larry Campbell alleged that DeShon murdered 20-year-old, Laqecia Herring because he did not want to pay child support and murdered her 17-year-old brother, Sterling Conner Jr. at the same time because of a gang relationship gone bad. Although the murder weapon had not been located, following the double murder charge, in March 2011, DeShon was charged with Possession of a Firearm by a Juvenile Delinquent. Case events were occurring on DeShon’s case and motions granting DeShon court appointed attorneys were withheld from the Leon County Clerk of Courts by Circuit Judge Hankinson. As DeShon was awaiting trial, in August 2012, the State Attorney’s Office, not the Leon County Sheriff’s Office, charged DeShon with Solicitation to Commit 1st Degree Murder of a witness in the double murder case, Trentin Ross. Circuit Judge James C. Hankinson signed the Summary of Offense for Solicitation to Commit 1st Degree Murder and Probable Cause, as well as the Arrest Warrant. The solicitation charge came about immediately following DeShon’s firing of his private paid attorney, Greg Cummings, whom DeShon’s mother had paid nearly $30,000. DeShon’s mother advised DeShon to fire Greg Cummings, for several reasons. According to Greg Cummings, DeShon was sitting in the Leon County Jail solely because of incriminating statements that Trentin Ross had provided to Leon County Sheriff Detective Don Odham. There was no physical evidence connecting DeShon to the murders. In July 2012, a month before his firing, Greg Cummings had not yet deposed and did not seem interested in seriously deposing Trentin Ross. In addition, Greg Cummings was deliberately ensuring that no one, not even DeShon, had access to the victims’ autopsy reports. State Prosecutor Jack Campbell refused to allow the District Two Medical Examiner’s Office to make public the victims’ autopsy reports. Dr. Anthony Clark had performed the victims’ autopsies. When DeShon’s mother heard from a source close to the Leon County Sheriff’s Office that Don Odham was not an employee with the Leon County Sheriff’s Office, DeShon’s mother repeatedly asked Greg Cummings about Don Odham being a Leon County Sheriff’s Detective—never getting a response. DeShon’s Pre-trial Hearing was rescheduled more than four times due to State Prosecutor Jack Campbell repeatedly filing motions—Motion for Continuance. 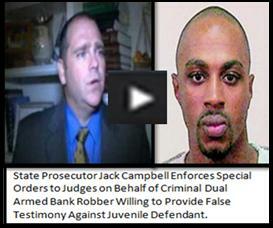 State Prosecutor Jack Campbell, Greg Cummings and Circuit Judge James C. Hankinson were deliberately delaying DeShon’s trial and withholding exculpatory (favorable) evidence, thus violating DeShon’s Constitutional Rights. When Circuit Judge Jackie Fulford was brought onto the case, DeShon and his mother was hoping for fairness, for someone to protect DeShon’s Constitutional Rights. DeShon had nearly four court appointed attorneys who’d all filed motions to withdraw, without bringing any evidence out. Seemingly, no defense attorney wanted to argue DeShon’s case against State Prosecutor Jack Campbell, the son of Leon County Sheriff Larry Campbell. Most of State Prosecutor Jack Campbell’s witnesses were his dad’s employees—staff members of the Leon County Sheriff’s Office. As DeShon’s mother quickly realized, Circuit Judge Fulford was following along with whatever direction that her former colleague, State Prosecutor Jack Campbell, instructed her in order to ensure DeShon’s conviction. In October 2013, three months after Circuit Judge Fulford began presiding over DeShon’s case, she allowed perjured testimony to go to the jury. Subsequently, DeShon was found guilty on Two Counts of 1st Degree Murder and Solicitation to Commit 1st Degree Murder. In December 2013, DeShon pled No Contest to Possession of a Firearm by a Juvenile Delinquent, a charge that had only been severed from the murder charges days before the October trial. Circuit Judge Fulford accepted the plea and then sentenced DeShon to Two Life Sentences plus 30 years. Since Circuit Judge Jackie Fulford presided over DeShon’s trial, Circuit Judge Jackie Fulford remained in Leon County. Circuit Judge Fulford presided over the State of Florida vs. Logan Murphy. In September 2013, Logan Murphy, a White male, brought a gun into the Butler Family’s home and shot their son, 17-year-old, Robert Butler, a Black male. Robert Butler’s parents were outraged! His parents had no idea that Logan Murphy had brought a gun into their peaceful home. Despite immediately having the shooter, eyewitnesses and the murder weapon, there was no immediate arrest made by the Leon County Sheriff’s Office. And when the Leon County Sheriff’s Office arrested Logan Murphy, State Attorney Willie Meggs charged Logan Murphy as an adult. However, State Attorney Willie Meggs did not charge Logan Murphy with Possession of a Firearm by a Juvenile Delinquent. In 2014, Logan Murphy entered a plea of No Contest to manslaughter charges. Circuit Judge Jackie Fulford sentenced Logan Murphy to three years in a juvenile detention facility and 15 years of probation. State Prosecutor Jack Campbell withheld adjudication therefore, upon Logan Murphy’s release from the juvenile detention facility. Logan Murphy will not be a convicted felon. Robert Butler’s family, again, was outraged. Only this time about the outcome of the case—the Butler family was victimized three times—once by Logan Murphy, second by State Prosecutor Jack Campbell and thirdly, by Circuit Judge Jackie Fulford. In February 2015, again, in Leon County, as Circuit Judge Jackie Fulford presided over a Death Penalty case, the State of Florida vs. Henry Segura case, Mr. Segura’s defense attorney, Chuck Hobbs, sought out to have an inmate in an out of state institution submit a DNA test, to see if the inmate could be connected to the crime scene. Henry Segura, a young Black male, was charged in 2012 with the November 2010 murders of a young mother, her twin six year-old daughters and her three-year-old son. Mr. Segura was the father of the 3-year-old. Police allege that Mr. Segura murdered the victims because he did not want to pay child support. If convicted, Mr. Segura could be put to Death. In April 2015, the JQC announced that Circuit Judge Fulford was being charged with three counts of misconduct. At least one of the counts of misconduct occurred prior to Circuit Judge Fulford presiding over DeShon Thomas’ trial and sentencing, as well as accepting Logan Murphy’s plea of no contest and light-handed sentence. Circuit Judge Fulford was not the original presiding judge on Mr. Henry Segura’s case, however, at least one count of misconduct that Circuit Judge Fulford has been charged, occurred before she began presiding on Mr. Segura’s Death Penalty case. None of the counts of misconduct that Circuit Judge Fulford is facing has anything to do with the three above named cases. However, it was not until soon after the JQC announced their charges of Circuit Judge Jackie Fulford, as to when a DNA analyst with the Florida Department of Law Enforcement came forward about having been told to withhold DNA findings that had been forwarded to her by the Federal Bureau of Investigation. In the report was possible exculpatory evidence in Mr. Segura’s case. The prosecutor on Mr. Segura’s case, State Prosecutor Jack Campbell, was two weeks away from selecting a jury to decide whether Mr. Segura murdered four helpless people, including his own son. Mr. Segura’s trial has been delayed. Mr. Segura has been in the Leon County Jail for nearly four years without any shred of physical evidence against him. Following the Judicial Qualifications Commission’s denial to dismiss charges of misconduct against Circuit Judge Jackie Fulford, two letters of support from the legal community have been filed by Circuit Judge Jackie Fulford’s defense team. One of the letters of support has come from local Tallahassee attorney, Benjamin Crump of Parks and Crump Attorney at Law. Mr. Benjamin Crump is a highly acclaimed attorney who specializes in wrongful death cases. Another letter of support has come from Donald M. Hinkle of Hinkle and Foran Attorney at Law. Mr. Donald Hinkle has had a successful career in medical malpractice cases. As Circuit Judge Jackie Fulford desperately seeks the support from the legal community to have a positive impact on her misconduct case, the families of defendants and victims whose cases Circuit Judge Jackie Fulford presided over with a favorable mindset (bias) to her former colleague, State Prosecutor Jack Campbell, continue to desperately seek justice for the life and death of their loved ones. Circuit Judge Jackie Fulford should never be allowed to preside over another case in any courtroom. Click on the link below to view letters of support. Next Next post: The New York Times and TV One —Fatal Attraction, Who Would’ve Ever Thought?